A little creativity and ordinary materials can protect your hardy roses in the worst winter conditions. Protecting your roses from harsh winter climates does not have to be difficult or complicated. Tender tea roses and grandifloras will probably have to be buried. Mounding soil at the base to protect the roots and bud union from extreme temperature fluctuations will take care of most hardy roses in the north. But is that enough? and what next? For starters, make sure you understand what you need to do for your specific rose in your specific climate. Selecting Roses, Winter Protecting Roses, and specific rose information in the Hardy Roses section should arm you with the information you need to decide what steps to take. Then devise a simple method so you don’t skip an elaborate process one year when you run out of time and wind up losing a rose. I have made a point to select hardy and easy care roses that require little or no protection in my zone, but no rose is foolproof and winter is unpredictable. So I have a very simple method, using simple materials, to protect my roses. I originally had three Canadian Explorer roses in my garden, now there are two. A particularly harsh winter and no more that a little mulch to protect them killed one of the roses. The Canadian Explorers are very hardy, but do generally die back to the ground each year in zone 4. After losing one I began protecting the roots and bud union with a deep layer of mulch. But as they became better established and larger I decided to keep them large by protecting the whole bush. Remember that you are not trying to keep the whole bush warm, but rather protect the canes from sun scald and wind burn, which will quickly kill exposed canes. So when my vegetable garden is done for the season, I place my tomato cages around the rose bushes. If your bushes are wide, you may need to wait until the ground begins to freeze, then pull the canes together and tie them loosely together. Then you will have a more compact bush to protect. 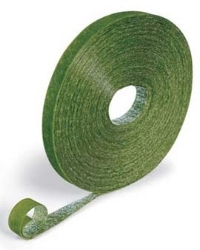 Use a soft plant tie, like the self gripping tape you can get from your local nursery, or on line at Gardener’s Supply. Twine can cut into or damage the canes. If you don’t grow tomatoes, you can use chicken wire or garden fencing to enclose the bush. Be sure to stake it to the ground with landscape staples so a stiff winter wind doesn’t pick the whole thing up. Your tomato cage can be wrapped in burlap, securing the burlap to the cage. Cover and secure the top also to prevent sun scald as the sun gets higher in the sky in late winter. This method also works very well for shrubs that are susceptible to sun scald and wind burn. Make it simple, use materials easily available, and the process only takes a few minutes. This protection method is pretty basic and easily used not only for roses, but for marginally hardy shrubs. Protecting evergreens can be done with similar methods, but do have slightly different needs than deciduous shrubs and roses. So check more specific instructions for Protecting Evergreens in Winter.